Who doesn't like strawberries and cream? It's a classic combination and a perfect way to end a meal if there is no chocolate in sight. 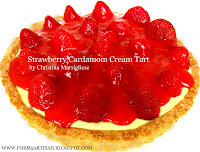 This tart is made with a buttery almond sweet pastry crust, filled with a rich cardamom- and orange-infused pastry cream that is elevated with cream cheese and topped with perfectly ripe strawberries and a fresh strawberry jam glaze. 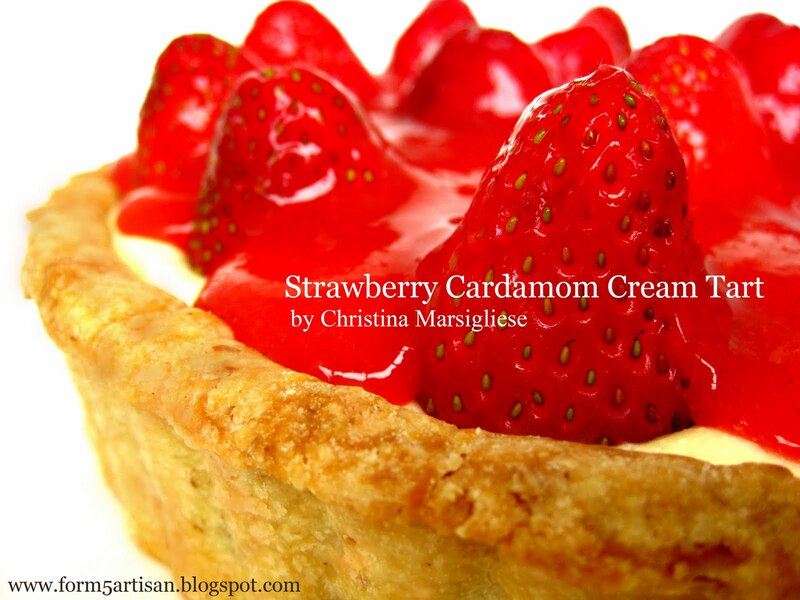 The pairing of cardamom and cream is one of my absolute favourites. It's a lovely complement to the fresh strawberries. To make the pastry cream, combine 5% light cream, orange zest and cardamom in a heavy medium saucepan over medium-low heat. Bring mixture just to a boil, stirring constantly. The mixture will begin to foam up at the edges when ready. Remove from heat, cover and set aside. In a medium bowl, beat egg yolks with sugar using an electric mixer on high speed until pale, thick and ribbon-like. Add flour and corn starch and beat until smooth. Remove orange zest from hot cream mixture and slowly add it to egg mixture in a thin stream while beating on low speed to prevent cooking the egg yolks. Pour mixture back into saucepan and cook over medium-low heat until very thick and boiling, whisking constantly. Boil 1 minute while whisking. Pass through a fine mesh sieve into a clean medium bowl to remove any curdled pieces of egg. Stir in vanilla extract. Immediately press plastic wrap directly onto surface of pastry cream to prevent a film from forming. Let cool at room temperature and refrigerate at least 1 hour or overnight. In a medium bowl, beat cheese using an electric mixer until smooth. 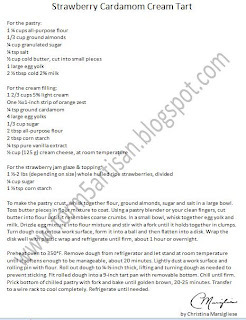 Add ¼ of chilled pastry cream and beat on low speed until combined. Add remaining pastry cream and gently fold it in using a spatula. Cover and refrigerate 30 minutes. Spread mixture evenly over bottom of cooled baked tart shell. 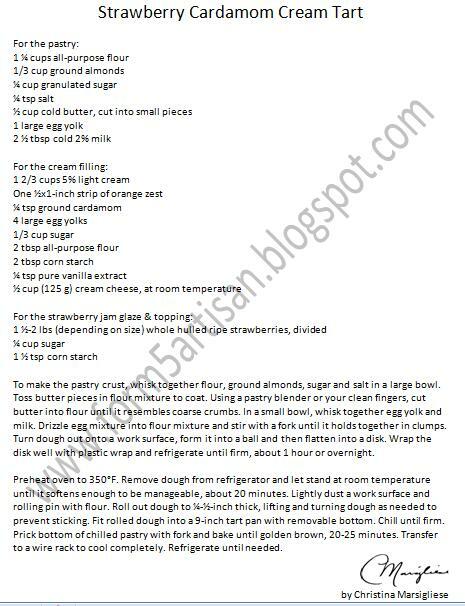 To make the jam glaze, puree ½ lb of hulled strawberries in a food processor until smooth (this should give you between ¾ and 1 cup of puree). In a small saucepan, whisk together corn starch and sugar. Slowly add strawberry puree while whisking constantly to disperse cornstarch evenly. Bring mixture to a boil, stirring constantly. Reduce heat to low and simmer 1 minute. Remove from heat and pass through a fine mesh sieve into a small bowl. Let cool to room temperature and refrigerate until cold. 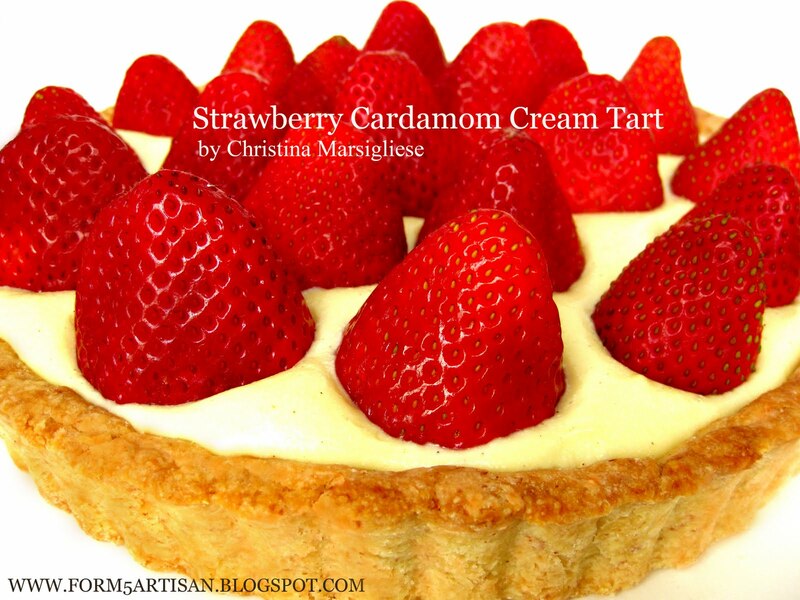 To assemble tart, arrange remaining 1-1 ½ lb(s) whole strawberries over the cream filling in concentric circles with bottoms up (i.e. cut side facing down). Spoon glaze around and in between strawberries. Use a pastry brush to lightly brush glaze over strawberries. Cover and chill 3 hours. Slicing into this tart may seem like a trick, but it can be done with care. You can always slice the strawberries and fan them out in concentric circles, but I love the dramatic effect of this presentation. 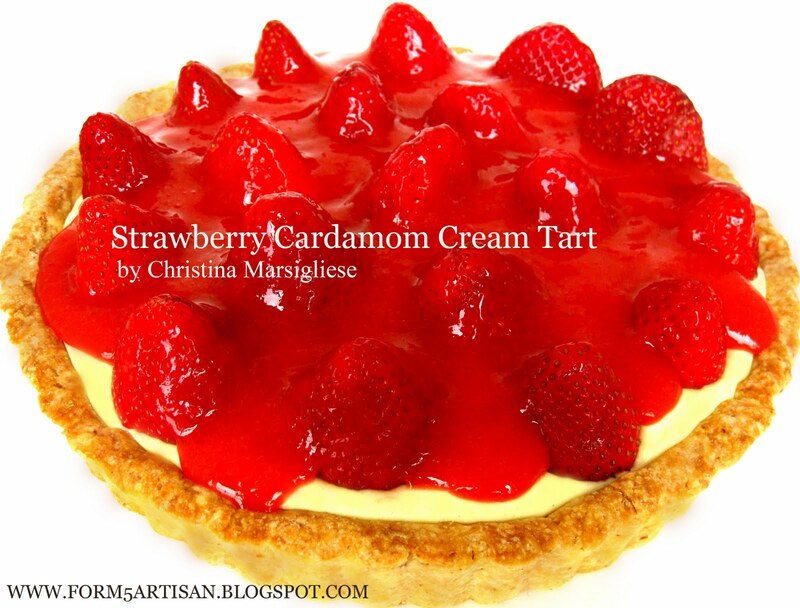 Also, placing whole strawberries into the tart creates valleys in which the jam glaze can sit. Serving this tart, as with any cream- or custard-filled tart, can be a bit messy, but I believe that's how it should be! It is strawberries and cream after all.